Men’s Black Stainless Steel Ring WIth Cable Accent | BUDK.com - Knives & Swords At The Lowest Prices! This handsome Black Stainless Steel Ring boasts a unique design, smart accents and looks great on any man, enhancing varied styles and wardrobes. Three separate bands encircle the ring; the two on the outer edges are polished jet black, offset beautifully by the silver-colored ring in the center. Between each band is a trough filled with braided black cable - a cool, distinctive accent that sets this men’s ring apart from the rest. Its stainless steel construction has a sheen and durability unmatched by more traditional ring materials - precious metals, ceramics and more. This ring is truly forged for a lifetime of vigorous wear, so you needn’t fear damage while working on a car, performing carpentry or other hands-on work. Available in sizes 9-12, we’ve got the perfect fit for any man. 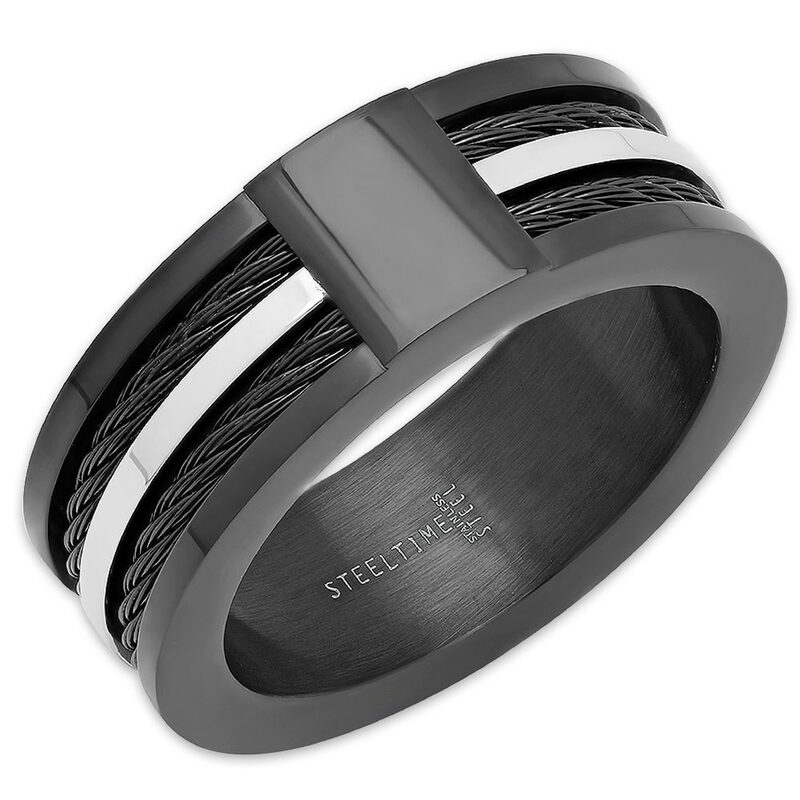 Whether you seek a modern take on the classic men’s wedding band or simply need a versatile everyday style accessory, the Men’s Black Stainless Steel Ring with Cable Accent is a great choice. It makes a fantastic gift, and you won’t find a better price on high quality jewelry like this anywhere else.